If you have been charged with a DWI in Texas, you might have been offered a way to avoid going to trial: the Texas pretrial intervention program. I’ve already discussed what the pretrial intervention program is as well as some of the pros and cons of participating. But if you’re trying to decide whether the program is right for you, your biggest question is probably about what to expect with your Texas pretrial intervention. 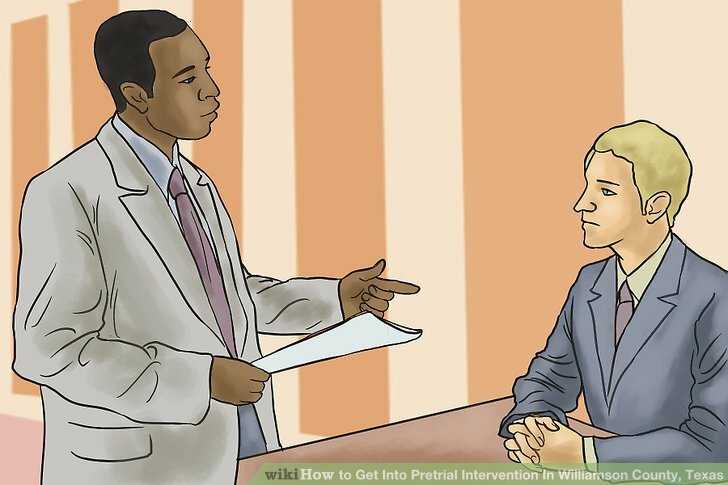 A pretrial intervention (or pretrial diversion, as it’s sometimes called) does mean avoiding a trial, but it’s a good idea to approach it with the same amount of preparation and research as you would if you were going to appear in court. Not everyone is eligible for the Texas pretrial intervention program. As we mentioned in previous articles, one of the goals of pretrial diversion is to prevent you from entering the court system in the future. The State is a cautious gambler, so they will not accept those that have some criminal history, as they believe that indicates a likelihood that you will be arrested again. Written application – The application is centered on your criminal history, but may also include your resume, reference letters, awards, accomplishments, and school and college transcripts as well. Essays – The standard is to write two essays. The first will give your version of the events leading up to your arrest; because this is effectively your admission of guilt, your version of the events should agree with the police report. Any efforts to defend your actions or blame the arresting officer could cause your application to be rejected. The second essay will include your goals and dreams, or why you want to avoid jail. Maybe you have a family to support, or you want to attend nursing school. Interview – The final step is a mandatory, but off-the-record, interview with a probation officer. Again, it is important that you stay truthful about the events leading up to your arrest and remain consistent with the police report. The probation officer may ask you to take a drug test as well. If your application is approved at this point, you will move on to the next step. The Chief Pretrial Services Officer then assesses you for your “potential suitability” for the pretrial intervention program. This step involves finger printing and a background check with the FBI as well as a professional assessment of your application. The Application/Assessment processes are meant to weed out those who are unlikely to be “rehabilitated.” My comment before about the State being a “cautious gambler” is a pretty accurate description of how they handle their pretrial intervention participants. Allowing you to enter the pretrial intervention program is a lot like placing a bet that they won’t see you again. The assessments are their way of seeing how likely they would be to win that bet. If they think you are likely to show up in court again in the future, they will not place that bet (meaning, they will not admit you into the program). Basically, the Pretrial Services Department wants to see that you are regretful and contrite, not arrogant or nonchalant. There are no national standards when it comes to inclusion into the program; your acceptance is entirely up to the Chief Pretrial Services Officer. You will stand a better chance of being accepted if you treat your application, essays, and interviews the same way you would behave in front of a jury: dress to impress, be polite, and avoid vulgar or hostile language. The length of your program will depend on the county, but 12-18 months is typical. At the end of the program, if all requirements have been met, the prosecutor will dismiss the charges and your case is closed. A Texas pretrial Intervention program fee that can range from $300 to $500 to be paid at the time you are accepted. Reimbursement to the corrections department for their work on your case. If this seems daunting, keep in mind that there is no “free” way to deal with the police if you are charged with a DWI; the cost of entering the pretrial diversion program is usually cheaper than paying for an attorney to defend you in court. Not to mention you will not have to pay the 3 year surcharge fee to the Texas Department of Public Safety for a DWI conviction. Because your case is at the discretion of the State, at any point in the process—even during the application step—you can be judged “unsuccessful.” Depending on how far you step out of bounds, you may be asked to jump through more hoops or you may be kicked out of the program altogether. If this happens, the State will resume its case against you, but now they have a big weapon in their arsenal: a signed agreement that you would plea guilty if you were not successful in the program. Most juries will not look kindly on a defendant who was unable to complete the pretrial diversion program, so the best thing you can do for yourself is to take this program as seriously as you would a trial. The Texas pretrial intervention program is not for everybody but for some, it can be a lifeline. I always advise those charged with a DWI to hire a qualified DWI attorney who will advise them of their rights and make sure they stay informed throughout their case. There is no “one size fits all” solution when it comes to court cases, and I want every one of my clients to receive the justice they deserve. Should I Complete the Bell County Pretrial Diversion or Go to Trial?